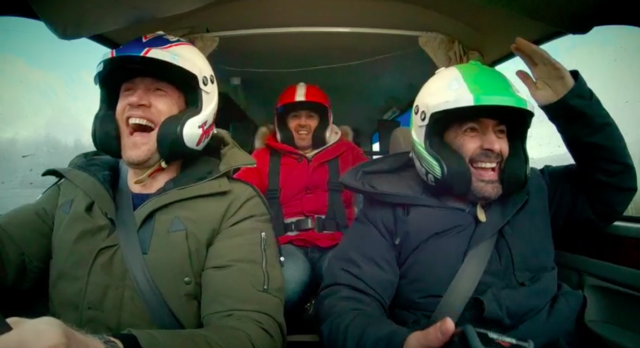 Andrew “Freddie” Flintoff and Paddy McGuinness hurtle around a rainy Welsh race track in a souped-up hearse in the first footage from the new series of Top Gear. The pair join Chris Harris as presenters for the 27th series of the BBC motoring programme, which will air this summer. In the clip McGuinness tries to convince the group the perfect second hand family car is in fact a hearse. To test out his theory they buy a 1995 Daimler hearse for £1,300, dubbed the Undertaker, and carry out modifications including installing a ball pit. The dramatic strains of Verdi’s classical piece Dies Irae ring out as the hearse tips and rolls onto its side and multi-coloured balls tumble about. The 26th series of the programme, which finished on Sunday, was the last with Matt LeBlanc at the wheel. The former Friends star joined the BBC Two motoring programme in 2016 but announced last year that he was stepping down because of the demands of the role.